Membership of the EU in Norway is no longer an issue. The latest polls put the anti-EU vote at well over 70 percent, and only 15 percent of voters actually support membership of the EU. Remarkably, though, the two main political parties, Labour (Arbeiderpartiet) and the Conservatives (Høyre), support the EU. And, although we have extolled the virtues of the European Economic Area (EEA), holding up the Norwegian membership of this agreement as an example of where Britain might go when we leave the EU, even in Norway there is opposition to this route. For instance, Helle Hagenau (pictured) would prefer to leave the EEA altogether, reflecting the official position of the country's "no" campaign, of which she is its International Officer. I first met Helle in Brussels in the 1999, when she was working alongside us in UKIP and the EDD group, then led by Dane Jens Peter Bonde. She is also a Dane, with a very strong left bias to her politics, supporting the social model and organised labour. It was no surprise, therefore, when she ended up working with the unions in the UK, on the euro campaign, and then joined the "no" campaign in Oslo where her organisation also works closely with the unions. Still boasting 30,000 members, it had reached 140,000 at the height of the 1994 referendum, making it the biggest political movement ever in Norway. Now, the "no to EU" campaign draws its funding from public subscription and from the unions, farmers and fishermen. It is a cross-party group, although it co-operates with the Red Party, the Socialist Left Party, Labour Youth, individual members of the Labour Party, the Centre Party, the Christian People's Party and the Liberal Party. The campaign's opposition to the EEA agreement (Eøs avtalen) rests on the perception of the "democratic deficit". They note that about 500 new EU laws were passed into Norwegian law last year, with little public debate and next to no consultation. The campaign recently supported the postal workers' opposition to the EU's postal services directive, and resistance is building to the data retention directive which, although passed after a compromise between the Labour party and the Conservative opposition, has yet to be adopted as Norwegian legislation. Stresses are intensifying as the number of EU laws requiring adoption increase, and January this year saw Norway being accused of "selfishness", picking those laws which suited it and ignoring the rest. As of October 2012, 427 EU laws were outstanding, awaiting implementation. Another point of conflict coming up is the "fourth railway package” which the Norwegian rail unions are determined to resist. Helle speaks enthusiastically about being outside the EU. As a result, she said, "Norway has kept its political independence both nationally and internationally". This has been "especially valuable in dealing with the United Nations", she told me. "When the Norwegian government decides to promote a certain point of view at the UN General Assembly, we just do it", she said. "There is no need to negotiate with numerous other countries and an EU Commission, resulting in a watered down version of that message". Confirming Anne Tvinnereim's experience, she recalls how, when she was a member of the official Norwegian delegation to the UN General Assembly in New York, she had both the Swedish and Danish delegations tell her that they had asked the Norwegians to present their case to the UN. They had been unable to do so themselves, constrained as they were by the "common position" within the EU. As to the British debate, she felt it was too focused on the economy and trade. What is lacking, she said, was the political perspective: "making your own laws, having your own say in the world, being able to influence your own politicians and not having to go to Brussels to do so". There were similar complaints in Norway though. There were complaints that parliament appeared to be non-representative of public opinion and even EEA issues were seldom taken up. 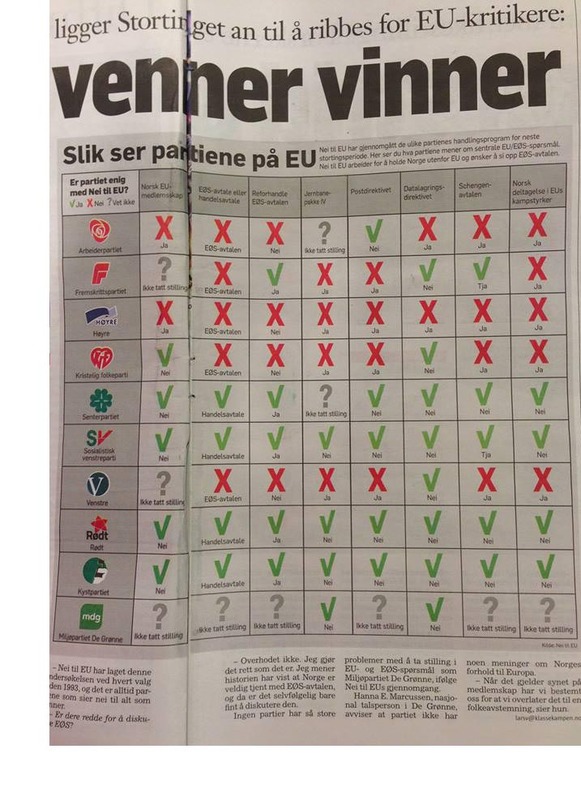 Last week, the Klassekampen (a left wing newspaper) carried an article based on a survey done by "No to the EU" (pictured right). It showed how the different parties in Parliament responded to EU issues, with the two biggest supporting the EU and the EEA. The green ticks show the support for the "no" position and the red crosses indicate the opposing view (click the pic to enlarge). Despite the general election coming up in September, the EU still tends to be a non-issue and the "no to EU" campaign is urging both parties and voters to raise the question of the EEA. Nevertheless, Helle completely understands the reasons for British support of the EEA. As a halfway house, it makes complete sense. But, she says, "If the UK were to sign up to the EEA Agreement, it would have to be renegotiated". She adds: "With Britain on our side we would be in a stronger position". Her organisation has been very active in researching alternatives to the EEA, and has produced a long report exploring the options. As an experienced campaigner, Helle is fully aware that positive alternatives must be offered. She sees in British euroscepticism, a great weaknesses in its failing to produce a credible alternative to the EU. "Just to say we must get out is not enough", she declares. Next year, Norway celebrates the 20th anniversary of the 1994 referendum which kept them out of the EU. Interestingly enough, 2014 is also the 200th anniversary of the Norwegian constitution. "No to EU" is sponsoring a history of the campaign, to be published on the anniversary, setting out some of the lessons learned. But one lesson is already evident. Having a well-established permanent "no" campaign, outside the political parties, is a great advantage when to comes to keeping the politicians on their toes. As a people's movement, their research keeps the debate alive. One of their latest leaflets, "four reasons not to join the EU", is a classic of its kind. "Defending a vibrant democracy was the main reason the people voted no to the EU in 1994", it says. "Outside the EU, we have a democracy where people participate and the politicians are accountable to the voters". Citing "solidarity", "environment" and "freedom", in addition to "democracy", there is no suggestion that economic grounds are a key factor. And in that, there is a lesson for us from most successful of all anti-EU campaigns. High ideals such as "democracy" do play well with the voting public. During the 1994 campaign, the "yes" campaign played the same FUD cards that our europhiles are using, right down to the "100,000 jobs" that were going to be lost if Norway didn't join the EU. Yet, when it came to the vote, self-governance mattered. When the people in Norway were given the choice, by an active and effective "no" campaign, they opted for democracy. Some would have us believe that such issues are "emotional" but, as Autonomous Mind also points out, we should "seize the positive". With the Norwegian "no" campaign leading the way, we can be confident that this is the way to go.